It’s become a cliché that government would be better if it were run by private-sector managers using standard business practices. But could the values and objectives of private managers ever be enough to preserve a nation? Take the definition of the word public – ‘of or concerning the people as a whole’ – and the word private – ‘belonging to or for the use of one particular person or group of people only’. Public management entails dealing with and/ or controlling the needs and interests of ‘the whole’, which is in many cases the nation. Private management involves managing the narrower needs of an individual or group. 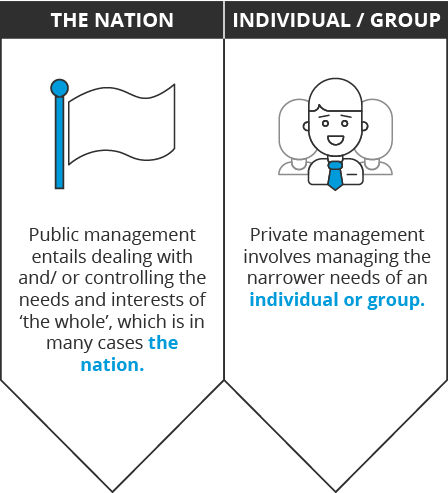 This difference in scope constitutes the first and fundamental distinction between public and private management, from which a number of differences arise. As they apply to such different groups of people – the whole of society vs. small, competitive subgroups – public and private management keep a vastly different defining value. Public management values public interest, public needs and political compromise. As a public manager, your primary concern is the overall wellbeing of your society. You endeavour to balance the needs of businesses, interest groups and individuals. Private management, on the other hand, values business profit. As a private or business manager, your first concern is the survival and economic success of your business. The managing director of a pen factory sets a quarterly goal of cutting costs to maximise profits, by using a cheaper ink supplier and switching over to a state-of-the-art conveyor belt. A presidential directive sets an annual goal to reduce poverty, with mission objectives to reduce “powerlessness” and “apathy”. A multitude of programs are prepared, with their own objectives, agendas and facilitators, to this end. How do these situations compare? For the private manager, setting goals and measuring success is straightforward, because objectives can be clearly defined and measured according to profit and loss. The broader implications for competitors, customers and suppliers are not considered in the narrow equation for business efficiency. For the public manager, objectives are abstract, overarching, somewhat undefined and exceptionally difficult to measure. That is because in the public sector, goals apply to a much broader jurisdiction than a single business. They encompass multiple programs and their success is measured by the overall betterment of society. Accountability differs largely between public and private organisations. Managers in public organisations are accountable to a much larger group of people – everyone in the governed area – and are always under public scrutiny. Such a strong and palpable public influence plays a significant role in their decisions. Ultimately, a public manager will attempt to appease as many people as possible while achieving results, adding to the complexity of their position. However, organisational commitment (the bond employees experience with their organisation) is usually weaker in the public sector. This can lead to the erosion of public managers’ accountability, inciting negligence and corruption. The private sector operates without the checks and balances of the public sector. Businessmen don’t escape public scrutiny completely, but remain accountable to a small group of shareholders and employees. Their focus can therefore remain on maximising the bottom-line. Public organisations are also far more transparent than private ones. In a free society, transparency is government’s obligation to share information with citizens. It is at the heart of how citizens hold their public officials accountable. When the 2008 financial crisis set in, businesses all over the world took a significant hit. But where businesses could decide to cut costs and lay off employees to survive, public management was faced with the resulting socio-economic consequences. Private firms are exposed to cross-cutting pressures from interest groups in the communities in which they operate. They must deal with governments and unions, as well as with their customers. But as a result of their broad societal mandate, public agencies are least insulated from external events. Whereas business can go on as usual, public management is not doing its job when society is in conflict or disarray. Franklin Delano Roosevelt, the 32nd President of the United States, served the longest term in office of over 12 years. Meanwhile, Leslie Wexner, is the longest serving Fortune 500 CEO, having managed L Brands for over 52 years. The difference is that in public management, political processes ensure that leadership changes frequently, while in private organisations, individuals can stay in leadership positions for an indefinite number of years. Public management follows strict procedural rules instated to ensure that power is not abused and the nation is well looked after. In fact, in many cases a public manager can have a huge amount of responsibility with very little authority. While in private management, it is the individuals with a lot of responsibility that also call the shots. In private firms, management relies a great deal on incentives and perks that encourage high performance. This is in line with their primary value of maximising profit. In the public sector, however, limits are applied to awarding high performance. With the fundamental value of societal well being, employees are encouraged by their honourable desire to serve the public. Are you encouraged by an honourable desire to serve the public? Master public management and governance to advance your career in the public sector with the University of Cape Town Public Management and Governance online short course.